I'm a writer and consultant living in Brisbane who loves travel in Australia, Asia, the Pacific and elsewhere. Eungella (pronounced Yung/gella) is famous as the home of that wonderful, bizarre creature, the platypus. This place calls itself the platypus capital of the world, the best location to see them in the wild. Eungella sits atop the Great Diving Range in the hinterland a one hour drive or 90 kilometres west of Mackay on the coast of central Queensland. 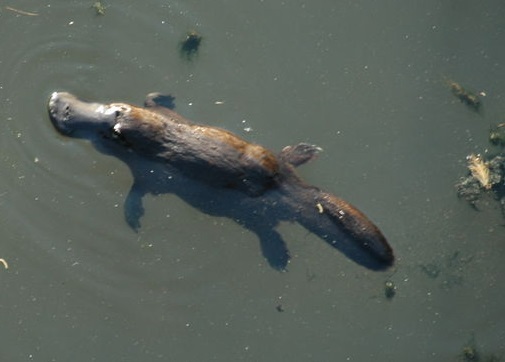 Broken River facilities including the best platypus viewing places are 5kms from Eungella township. To give yourself the best possible chance of sighting the platypus, be at the official viewing platform a short walk from the carpark on the left of the traffic bridge over Broken River as you head west or under the bridge soon after dawn. On our first attempt at dusk we waited for over an hour with a couple of very impatient boys, arriving too early. We gave up before any furry little swimmers appeared. Determined not to leave without seeing a platypus, we set our alarm clock and headed for the river around dawn. We staked out the edge of the river under the traffic bridge and were rewarded almost immediately. Around five platypuses surfaced, swam and dived back under. It was difficult to tell just how many were feeding and playing in that stretch of river since two or three would come up at once, then another a little further along the river, then another, while the first ones dived back under. Elusive they certainly are. It was wonderful to see these unique creatures in their natural habitat. Children and adults alike were thrilled. Quietly though, as we didn't want to scare them away. Several tourists from across the world shared the experience with us. There are reports that platypuses can also be seen on overcast days, but you would have to be very lucky. Staying up here overnight is a good option. Given the steep, winding road up to Eungella from the floor of the Pioneer Valley, many would not relish the prospect of driving down the range in the dark after a day of walking, picnicking and platypus spotting at dusk. Temperatures up here are generally cooler than on the coast, although it can still be hot in summer. Eungella National Park has extensive walking tracks through lush tropical rainforest. Although clearly the star, the platypus is not the only wildlife attraction. Rare birds, reptiles and marsupials can also be found here. If picnicking or barbecuing beware of swooping kookaburras which are extremely bold when hungry. They can steal a sausage right out of your bun. See information on walks, wildlife and camp grounds in Eungella National Park here . Accommodation close to the platypus viewing areas is at Broken River Mountain Resort. Details are here . The resort has several sizes of cabins available catering for couples to five or six people. Rates are from $130 per night, more for popular times such as school holidays. The resort also has a restaurant. You can stay in a room in historic Eungella Chalet right at the top of the drive up the range. Rates are from $115 per night, or from $130 per night for a cabin. See details here . The chalet has a restaurant and terrace overlooking magnificent views to the Pioneer Valley below. On an overcast day you can dance in the clouds. It's only natural, since the name Eungella means Land of the Clouds.